1. To work with the poor and disadvantaged people. 2. To help the poor and needy regardless of race, creed or nationality respecting their dignity, sharing our blessings, hope and fatih and encouraging them to take control of their own destiny. SSVPseeks to respond to the call to bring the love of Christ to those in need:“I was hungry and you gave me food” (Matt 25).Vincentian true mercy and compassion is not merely about giving things but helping the person realise that there is a loving God and that he or she is also a lovely child of God. 2. Contrary to SSVP works, Legionary work is confined to prayers, visitations - home bound or hospital, and any other activity in the sense of charity. 3. To regulate, assist or develop the structures, activities and wellbeing of the constituent youth bodies in the Vicariate as well as their governing committees. 4. To set and implement guidelines for an effective worship environment. under the guidance of the Holy Father. 5. Raise up or support more full time pastoral workers, mission volunteers or trailblazers. 8. 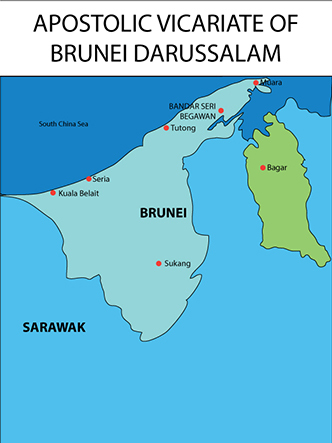 To support the realisation of national goals and aspirations as may be directed by the Ministry of Education, Brunei Darussalam.